Margaret River Farmers Market, Winner 2018. 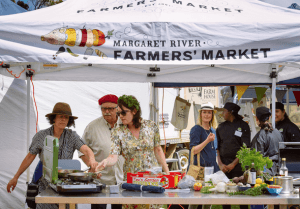 Delicious Magazine Produce Awards 2019 are seeking contenders for Australia’s Most Outstanding Farmers’ Market… a vibrant and engaging community-focused farmers’ market that displays ‘true authenticity’. ‘True authenticity’ is evaluated based on the following definition: ‘A Farmers’ Market is a predominantly fresh food market that operates regularly within a community, at a focal public location that provides a suitable environment for farmers and specialty food producers to sell farm-origin and associated value-added specialty foods for human consumption directly to customers.’ Definition sourced from the Australian Farmers’ Markets Association. Please note: An authentic farmers’ market excludes resellers, and arts and craft goods, unless made on-farm from farm origin product. Entry is via application. Completed applications must be returned by the deadline to be considered for entry. The deadline for 2019 entries is 5:00pm AEDT on Friday 5 April 2019. The finalists for the 2019 Outstanding Farmers’ Market award will be announced in June 2019 and the national trophy winner will be announced at the awards event in August 2019.